Creepy is the latest feature from the prolific Japanese director Kiyoshi Kurosawa. Written by Kurosawa and Chihiro Ikeda, Creepy is a dark and oddly droll adaptation of the novel by Yutaka Maekawa. The film opens in an interrogation room where a detective, Takakura (Hidetoshi Nishijima) is questioning a serial killer. The murderer is smiling and relaxed – Takakura is fascinated by this example of a ‘perfect psychopath’ and is eager to continue examining the prisoner. His overzealous professional curiosity brings about a harrowing situation, as moments later, the killer breaks free and ends up threatening the police and holding a fork to the throat of an innocent woman. Takakura fails to defuse the hostage situation and the result is that the smirking killer and his hostage end up dead and Takakura is himself seriously injured. The story then divides into two parallel narrative tracks – A year later, having resigned from the force after this debacle, Takakura works as a professor of criminal psychology at a local university. He and his wife, Yasuko (Yuko Takeuchi) move into a new home in a Tokyo suburb with their dog. One day Takakura’s former protégé, a young detective called Nogami (Masahiro Higashide), drops by the college to see his old boss and to ask him for help on a cold case. It involves the unsolved disappearance of the Honda family, which left behind a mourning daughter, Saki (Haruna Kawaguchi) who claims to remember little of the events leading up to the disappearance. Intrigued, Takakura agrees to unofficially assist in reinvestigating the case. As Takakura questions Saki and pursues leads to solve the mysterious disappearances, his wife Yasuko attempts to settle into their new home, which includes trying to befriend the neighbours. They prove an inhospitable bunch, none weirder than a man called Mr. Nishino (Teruyuki Kagawa) who claims to be a financial analyst living with a sickly wife and a teenage daughter. Out of loneliness, curiosity and politeness, Yasuko remains pleasant and communicative to Nishino, who, after initially being hostile, abruptly turns into a smiling, attentive and ingratiating charmer. This swift, unexpected change is itself a mystery, but it appears to have a direct connection to her husband Takakura’s rapidly developing cold case. Eventually, the story lines and characters converge and the mystery is revealed, although not necessarily explained. It does however, tragically lead back to Takakura’s interest in the ‘perfect psychopath’. Creepy is classified as a horror movie and, on one level, it can be seen as such. Kiyoshi Kurosawa is a master of unease and of the gradual build-up. His movies are populated with malignant forces (living or dead) but the truly disturbing moments are not the goriest ones. We are often most unsettled by gradual shifts, that turn the mundane into the menacing and unfathomable. Somewhat like David Lynch, Kurosawa tends to merge the macabre and the everyday in a way that comes to reveal a lurking evil. In his films (which include Cure and Pulse, both classics of modern J-horror) an eerie atmosphere of menace begins to emanate from familiar situations and locations. Here, Teruyuki Kagawa’s sly performance as the sinister neighbour Mr. Nishino, is what gives Creepy its title. Nishino belongs in the roster of oddest next-door psychos – switching between unamicable and surly to flirtatious and ingratiating, but we never fully understand his motivation or background, which means we never know quite what to expect. Creepy certainly lives up to the name, but it also offers the puzzle of a detective story, the emotional undercurrents of a domestic drama and the suspense of a psychological thriller. In his film Kurosawa also examines the unhealthy divide between family and work, and the extremities of love, perception and curiosity. In Creepy, trusted logic and homely comforts gradually become perverted into something freakish and uncanny. Watch it at The Ritzy! 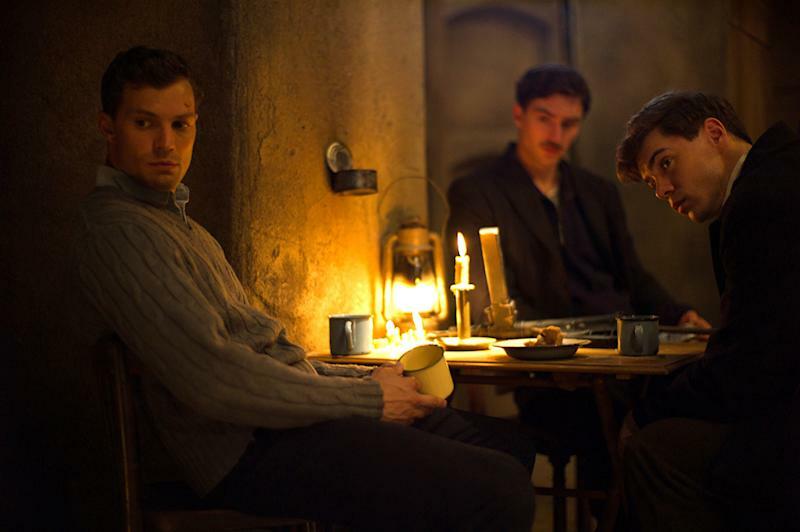 There are worse ways to spend an evening than in a darkened room with Cillian Murphy and Jamie Dornan, watching a movie. In this case, we were watching the Premiere of the Sean Ellis WWII thriller Anthropoid in which they both star. Anthropoid is based on the astounding and moving true story of two Czechoslovakian nationals, Jan Kubiš (Jamie Dornan) and Jozef Gabčík (Cillian Murphy) who in 1942, parachuted back into their occupied homeland with the mission of assassinating the Nazis’ brutal third-in-command, SS General Reinhard Heydrich, the’ Butcher of Prague’ and architect of the horrific ‘Final Solution’. Jozef and Jan soon learn they are in a city in lockdown, brutalized into submission by the German occupation, with the Czech resistance decimated to a handful of determined if fearful patriots. Contact is finally achieved with an underground activist, Uncle Hajský (Toby Jones) who is stalwart in aiding their endeavour, as well as Resistance leader, Ladislav (Marcin Dorocinski) who, having been resident in Prague throughout, knows and fears the potential savagery of the Nazi reprisals if the mission is successful. With sparse intelligence and little equipment the two men must find a way to fulfil their mission, under seriously adverse conditions, while trying to protect their identities from the sweeping control of the Gestapo. When Jozef and Jan move in with a sympathetic family, they meet Marie (Charlotte Le Bon) and her friend Lenka (Czech actress Anna Geislerova) who agree to pose as their girlfriends to deflect suspicion. As the assassination attempt unfolds, the film hurtles into action; the inevitable manhunt ensues and climaxes in the Nazi siege of a church where the surviving men of the Resistance are hiding. Sean Ellis (shooting on Super 16mm film) demonstrates his finesse filming locations and period detail and his camera-work gives a raw and immediate energy to the unrelenting violence of the climactic shootout. Be warned, once the movie gains momentum, hang on to something, it is a fierce and terrifying ride. Aided by screenwriter Anthony Frewin, Ellis has produced a well-written and engaging screenplay. 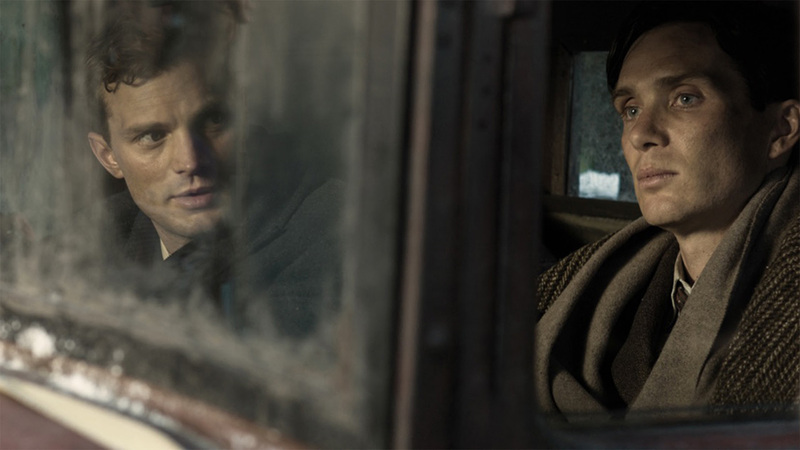 Anthropoid is a slow burn, allowing us get to know and empathise with the principal characters, who unlike fictional war heroes, are not given to grandiose statements and bravado, but succumb to moments of doubt, panic, aching hope and crushing guilt. Jamie Dornan’s Jan is the more nervous of the assassins, his burgeoning feelings for Marie causing him to value his life and gain a flicker of hope for a future. He experiences panic and desperation before accepting the risks of his objective. Cillian Murphy is charismatic on screen, successfully conveying Joseph as a patriot who is determined to remain icily focussed on his mission, but struggles to control his emotions as he finds a match in Lenka’s acuity and fearlessness, and strives not to buckle under the guilt of the inevitable tragedies that pile up around him as a consequence of the mission. Unlike most of the movie fare we’ve been served over the last few years, here are human heroes whose honour and bravery do not derive from having ‘superpowers’ – their fragile lives have the shadow of danger and destruction hovering over every move. Because we are aware that this story is based on real people and real events, the tension in the movie never releases its grip, gut-wrenching and unrelenting in its examination of the realities of living under a vicious totalitarian regime. Anthropoid is a fitting tribute to all the little-known stories of ordinary men and women who were forced into extraordinary acts of self-sacrifice and bravery in the face of actual, pitiless evil and incomprehensible violence. We have our freedom because of what those true heroes were prepared to endure to create a better future for us all. ANTHROPOID IS OUT 9th SEPTEMBER! Directed by Tod Williams (Paranormal Activity 2) and apparently co-scripted by King himself, Cell brings yet another adaptation of a King best seller to the big screen, reuniting John Cusack and Samuel L. Jackson after their first foray into Stephen King territory in Room 1408. John Cusack plays comic book artist Clay Riddell, whose cell-phone runs out of juice while he is calling his son on arrival at a nondescript airport terminal. Searching vainly for somewhere to recharge, he finds all the outlet points already taken by people charging their phones, and those who are not charging cell-phones have their ears pressed to one and are making calls. His frustration turns to bemusement and terror as he finds he is one of the very few survivors of an inexplicable event known as ‘The Pulse’ which sends a mysterious signal through the global network turning all those using a cell phone (and that seems to be most everybody) into mindless, rabid, foaming killers. At first, the zombies, (called ‘phoners’ in the book), attack everyone, including each other, in a frenzy of bloodlust. Riddell, another of King’s surrogate everymen, narrowly avoids the madness, still in possession of his senses thanks only to the chance event that had his phone die at the moment that every other operational cellular device was infiltrated by the rage-inducing signal. 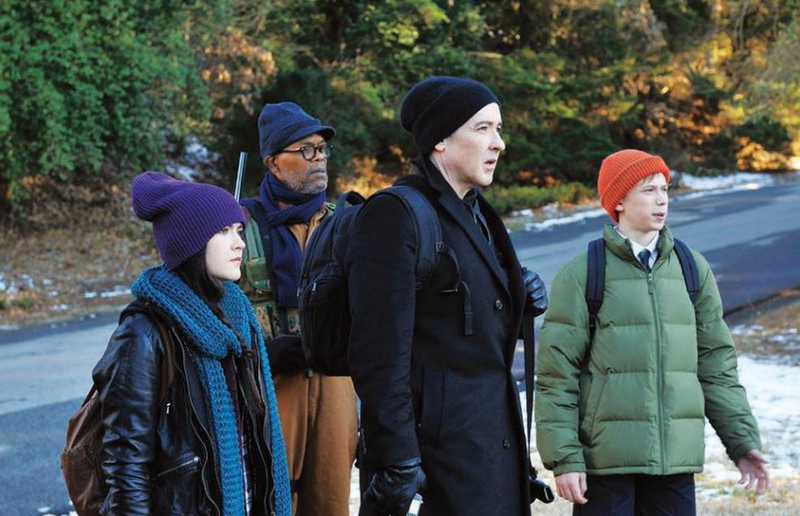 Escaping the murderous mob at the airport, he ends up allied with a cool-headed stranger (Samuel L. Jackson) who happened to be underground and had no phone signal, and a frazzled teenager (Isabelle Fuhrman) hiding out after her mother goes mad in the initial outbreak. Riddell is determined to find his son and estranged wife in Vermont, and leads this makeshift family on an episodic road trip, crossing New England on foot and encountering various survivors such as schoolboy Jordan (Owen Teague) and his headmaster (Stacy Keach) along the way. Though this film begins with a technology-gone-awry premise, the pale, slavering, slack-jawed roaming hordes give Cell the distinct feel of a zombie movie. Considering the ongoing popularity of shows like The Walking Dead, that might seem to guarantee something of an enthusiastic audience. King has touched on the Zombie genre in some of his books before Cell: in ‘Home Delivery’(in ‘Nightmares & Dreamscapes’) he wrote a kind of zombie love story and the Slow Mutants in ‘The Dark Tower’ series are that world’s particular version of the undead. Cell displays a kind of B-movie sensibility that hearkens back to the classic Zombie movies of Stephen King’s pal, George A. Romero. Sprinting with the speed of the 28 Days Later or World War Z zombies, the ‘Phoners’ develop a hive-mind and begin to move in swarms. They soon evolve new methods of recruitment to grow their numbers, communicating throughout their ‘network’ by emitting an atonal blare of modem noise. They appear to be controlled by a deformed and dishevelled entity called ‘The Raggedy Man’ (Joshua Mikel) who, it transpires, was present as an imaginary villain in one of Riddell’s graphic novels (but this thread is never adequately explained or developed). Even while faced with this threat, the humans still cannot find unity and continue to commit atrocities against each other. Despite the gore and violence, there is always the slight indication that perhaps it is time for the species as we know it to become extinct, and that the humans are the true monsters. The effects in general, from the digital explosions to a climactic horde of the infected, betray limited resources. The film doesn’t quite succeed in effectively conveying the breakdown of society, which appears to happen all at once and is immediately accepted and understood by the survivors. Williams tends to capture the small-scale skirmishes, outdoor gunfights and gory scenes—people thrown from balconies; a man munching on his dog—in erratic, shaky-cam close-up, often with not enough extras to convey the panic and chaos. The most impressive spectacle is a burning plane punctuating the airport carnage by crashing into the terminal. Cell works best when it shifts its dramatic focus to the desperate and disparate group of people fleeing from shelter to shelter hoping to find some kind of safe haven. However, there is a minimum of spectacle, much filming in outdoor locations and rather a lot of time spent hiding in darkened buildings where, although the characters talk a fair amount, they seem to say disappointingly little. The conventionality of the characters is partly saved by the cosily familiar presence of Cusack and Jackson, and workmanlike turns from the youngsters Fuhrman and Teague. This adaptation of Cell is diverting enough if you are a fan of variations on the zombie genre, but it will probably join the already overstuffed ranks of rather mediocre screen versions of Stephen King’s ever popular stories. CELL IS OUT IN CINEMAS AND ON VOD NOW! During the blockbuster summer months, it’s an unusual event to go into a darkened room and see something disturbingly different. During the opening titles of Brady Corbet’s debut feature The Childhood of a Leader, avant-garde composer Scott Walker’s menacing and edgy strings cut into archival footage of World War I troops marching in formation. Walker’s score is a particularly prominent feature, and slices into the movie like the scalpel of a nervy surgeon. The music for the entire movie sounds as if it were written for a particularly gruesome horror. The desired effect one presumes, is to telegraph to the audience that this is a truly ominous origin story, on par with the rise of Damien in ‘The Omen’. Corbet however, has made a debut that’s far more European in its sensibility than American. The film not only takes place in France, it also deals with a particular event in European history: the Treaty of Versailles – when one world war was coming to an end, even as the conditions for the next were being propagated. Corbet wrote the script with Mona Fastvold, and it is reportedly based on a 1939 short story of the same title by Jean-Paul Sartre that traced the evolution of a young boy from problematic early years, through Freudian therapy, to his espousal of anti-Semitic Fascist ideology as an adult. When I discovered this, some of the more difficult aspects of the movie started to make sense in a kind of ‘Sartreian’ way. The film is divided into five sections (an overture, three ‘Tantrums,’ and a coda)and begins in 1918, when a seven-year-old boy moves to France with his American diplomat father (Liam Cunningham) and German mother (Berenice Bejo) and has to adapt to a new language and the devout European Catholicism of his mother. His father is an assistant director to President Wilson’s Secretary of State, and is prominent in conducting the Paris peace negotiations. 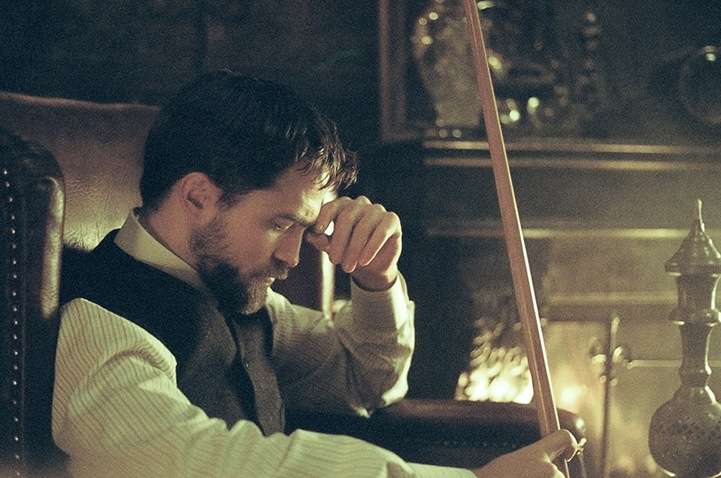 Much of this is explained in a mumbled and detached introductory dialogue between Cunningham’s character and widowed journalist Charles Marker (Robert Pattinson, who appears to play another role later in the film) as they exchange political views and academic analogies over a hazily inebriated game of billiards and subsequent brandy-and-cigars. While the music veteran Walker was a brave choice of composer, the film isn’t entirely in sympathy with his strident, turbulent score. The thunder and terror of the instrumentals seems at odds with the subdued colours and lighting in which cinematographer Lol Crawley bathes the family house. The house takes on a character of its own, exuding moods and secrets evoked through oblique camera angles, muted colours and shots that linger just that little bit too long in empty, shadowy rooms – the watery winter sunlight giving a blue-grey tinge to everything. At the centre of this pensive and crepuscular environment is the child Prescott, played with disconcerting assurance by British newcomer Tom Sweet (who more or less overshadows the entire adult ensemble). The boy passes his time by cold-bloodedly antagonizing those around him (in blatantly Freudian manner) by throwing rocks at parishioners after the church Nativity play, grasping the breast of his gentle French tutor Ada (Stacy Martin) whom he then summarily dismisses, parading naked through the house during one of his father’s important meetings and finally locking himself in his room and going on hunger strike. His offenses result in battles of will between the boy and his equally hard-headed parents, whose determined acts of discipline are met with indifference or disdain. Only kindly and affectionate housekeeper Mona (Yolande Moreau) seems able to mediate, but when she is caught being lax in enforcing a punishment she is fired by the mother, which causes the first truly emotional outburst from the boy. His parents occupy their own separate worlds within the home and have a distant relationship – the mother not wanting any more children, the father possibly philandering – nothing is made obvious, and we are left to draw our own conclusions. The parents come together only to eat dinner or confer on the care and discipline of the boy. The boy may be headstrong to an obnoxious extent, yet seems no more disruptive than any entitled upper-class son of that era. It is Tom Sweet’s performance, an extraordinary piece of work by an actor so young, which impressively anchors the film. However, the disorienting, obscure, pseudo-historical finale, where the camera itself becomes a wildly crazed thing, prompted by Walker’s increasingly mad and intimidating score, almost annuls the visual virtuosity attempted earlier. The Childhood of a Leader is an audacious initial cinematic statement, its cerebral doggedness disguising the fact that it dispenses with the psychological complexities of Sartre’s source material. The movie may be too much a politically-infused adult fairy-tale to find much approval amongst the Hollywood crowd, but I suspect that was never Corbet’s intention. The Childhood of a Leader is out on DVD & Blu-Ray now! The Intent (2016) is a dark crime thriller about criminal gangs in London. Undercover detective Lee Biggins, also known as ‘ Gunz ‘(Dylan Duffus) is thrust into a world of violence and excess when he joins the TIC crew, the most successful gang in South London. The crew is led by the ruthless Hoodz (Scorcher). The gang begins by peddling weed and drugs but quickly moves on to ruthless armed robberies with no regard for any casualties they leave along the way. Their increasing infamy amongst the criminal fraternity affords them a life of guns, drugs and hookers, but their indiscretions and extravagance also attracts the attention of the police and a rival gang. Playing his role as gang member ‘Gunz ‘, undercover officer Biggins becomes seduced by the criminal underworld of flashy cars, lavish lifestyle and easy women. Once he becomes enmeshed in the TIC gang, he finds a warped form of surrogate family loyalty that he never had. Thrilling to the adrenalin rush of crime and the high life, the young detective gradually begins to lose his identity as an officer of the law. He communicates less and less with his increasingly frustrated police chief as he is torn between his loyalty to his principles or to his ‘brothers’ in his gang ‘family. Things take a turn for the worse when the reckless gang leader Hoodz (Scorcher) murders the unarmed female owner of a post office during a heist and has a one night stand with the victim’s unwitting daughter after a drunken night out at a club. Will Detective Biggins betray the gang and bring the crew to justice? Or will the merciless crew discover his true identity first? Set in the heart of London, The Intent is a chilling tale of ego, violence and greed, and features a cast of UK actors and musicians, including Krept and Konan and Fekky. It concerns gang warfare, indulgence and drugs and explores the collision between good and evil. It’s a crime thriller which reveals the perilous consequences when the two worlds of crime and justice collide. The film explores the downfall of the TIC crew, who turn to crime because of a desire to become ‘somebody’. Part of this need is the impulse to attract unwanted attention which panders to their inflated egos. Their increasing greed and desperation leads to confusion, paranoia and the misplacement of loyalty and trust, then ultimately to infiltration and dishonour. Arguably, The Intent certainly looks like a fairly authentic ‘street’ movie but plays to the stereotypes of black on black crime. It does no favours regarding the rehabilitation of the reputation of black communities in urban areas of the UK and the problems they face. It would have been interesting to have had more development for characters such as ‘Mitch’ played by the director/writer Femi Oyeniran, who attempts to break away from the apparently inevitable route his contemporaries take, and the wives and mothers who have no sympathy for the life their boys have chosen. The Intent is a well-constructed film, bookended by a particular scene which reveals the essence of the main character’s dilemma. However, it is also rather too long and might benefit by a tightening of the storyline and some judicious editing of overlong dialogue and unnecessary scenes. The soundtrack to the film features Ghetts, Scorcher, Tanika, Stormzy, Fekky and Ms Banks on an 18-track album, all songs being written specifically for the film. In Remainder, his debut feature, Omer Fast gives us his take on Tom McCarthy’s brilliant cult novel; an original, reality-bending, psycho-thriller which submerged us in the bizarre mind-warp of a damaged protagonist. A young man is left both mentally and physically shattered after a mysterious accident in which he is struck by heavy debris falling from the high glass-canopy roof of a swanky London building. As Tom Sturridge’s nameless character awakes from a coma, he finds he cannot remember the accident that smashed his body or the events leading up to it. As he struggles to recover, he accepts an offer from the company responsible that will pay him eight and a half million pounds in compensation, if he agrees not to pursue any legal charges or ever mention the accident in any public forum. The settlement is more than any judge would award in court, so he agrees and finds himself very rich indeed.In fact, rich enough to pursue any odd whim he may be entertaining. What he uses his new-found fortune for, is to indulge his obsession with re-staging in absolutely strict detail, the disjointed events he recalls, in the hope of regaining his memory of the past. He starts by hiring a well-connected fixer called Naz (Arsher Ali) as his project manager, whom he tasks in tracking down and then buying and converting an entire London apartment block which he has been seeing in his incoherent waking-dreams. His next step is to choose actors to play his ‘neighbours’, who he remembers only in snapshots, so he commands his assembled cast to replay the same mundane tasks in his building on a constant loop. His attention to detail is maniacal – even down to hiring cats to sprawl on the rooftops. As the young protagonist grows ever more ambitious and dictatorial, his narrative grows more unreliable. He chooses to re-stage a violent shooting in his neighbourhood, in which he may partly have been a catalyst. This leads him on to replicating a full-scale bank robbery on a giant Hollywood-like sound-stage, in a set meticulously dressed like an actual bank in a real London street. As the young man pushes to make his faked scenes ever more realistic, pieces of the puzzle are revealed but reality itself begins to fray at the edges. Scenes, characters and lines begin to loop through the story as recurring motifs. “We’ve had this conversation before, don’t you remember?” becomes a repeated question in various dialogues, riffing on concepts of reality, replication, repetition and memory. Omer Fast seems to be playing with traditional notions of sequence to deconstruct a linear order of events and make palpable the central dilemma of his leading character. Tom Sturridge (seen most recently in BBCs The Hollow Crown) gives a compelling performance as the driven, overbearing, yet fragile character whose frenzied preoccupation provokes an increasing atmosphere of foreboding, as he tries to reconstruct what seem to be random elements of his existence to some level of coherence that will reveal his truth. Sturridge’s stiffened gestures and enigmatic dreaminess, paired with shifts in focus and disorienting sound effects, work to simulate the perceptions of his damaged mind and body. He is ably supported by Arsher Ali’s wonderfully British ‘Naz’, revealing a slightly comic bemusement when rationalising his boss’s eccentric demands, along with a stoic professionalism, as an increasingly intimate and complex relationship develops between the two characters. Although Remainder exhibits some limitations that beset most low-budget debut features, it is an impressive and intelligent adaptation of McCarthy’s experimental novel. It has a feel for the shocking and sinister and honours thriller tropes without sacrificing the novel’s essential oddness. The film ends on a satisfyingly cyclical twist, which for me, makes Remainder one of the most original and intellectually engaging psychological-thrillers I’ve seen since Chris Nolan’s Memento.